Considering both the impact of Sophie Calle’s work on emerging artists and the success of her recent retrospective at the Pompidou Centre, Sophie Calle M’as-tu-vue? comes at the right moment and seems destined to live on beyond the exhibition as an essential compilation of Calle’s projects since 1978. In hoping to meet these different demands, it is at once an artist’s book, a critical overview and a catalogue. This makes for its breadth but also explains certain weaknesses. The padded cover, small format and soft pink paper have a diaristic intimacy, and the inside resembles a scrapbook displaying an accumulation of documents printed on paper of various qualities and sizes. These range from facsimiles of diary pages to postcard-sized installations shots printed on glossy paper. Calle’s works are presented each on a few pages and arranged chronologically and thematically. This cannot fail to disappoint those who remember the original formats and the elegant layouts of the artist’s early books, such as L’Hotel, (Les Editions de l’Etoile, 1984) whose peculiarity made them sit somewhere between art and literature. 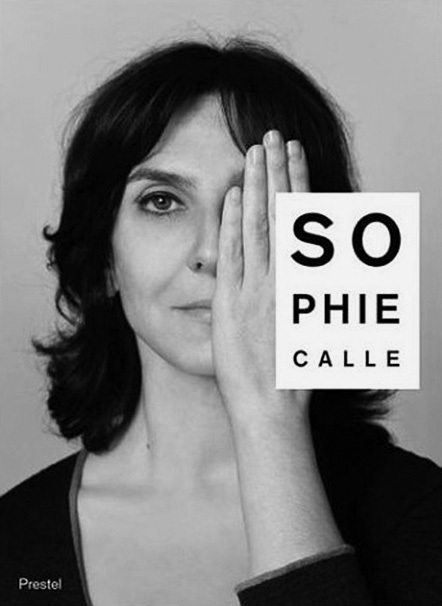 Sophie Calle M’as-tu-vue? instead contains mostly extracts of her pieces arranged differently from previous publications. Sections on projects are interspersed with installation views, and both contribute to trace a genealogy of the displacement of her work from the book to the exhibition form, while also emphasising the conceptual aspect of a body of work that is largely context-specific and in a sense only exists through its reproduction. The multi-layered layout enables the reader to browse and accumulate clues towards a constantly shifting portrait of the artist. The enigmatic quality of the image documentation accounts for the fascination exerted by the extensive biographical interview of Sophie Calle by Christine Macel, and the clinical psychological portrait commissioned by Damien Hirst. Next to these, the other texts range from the anecdotal (by the novelist and friend Olivier Rolin) to the unnecessarily complex: an essay by Christine Macel that counterpoints, with little notable results, the theme of the death of the author with Calle’s use of authorship. More intriguing is Yve-Alain Bois’ contribution, which follows a previous essay published on the occasion of Calle’s first Parisian retrospective in 1991. Here, Bois skips from one topic to another, toying briefly with an idea before remarking upon a set of coincidences. As such, his essay pleasantly evokes Calle’s working process but is a disappointment inasmuch as it refuses to engage with Calle’s work on an art-critical or historical level. Whereas the installation views emphasise the visual in Calle’s work, none of the texts strives to discuss and position her work in relation to conceptual art, performance, or narrative fictions. Instead, most of the texts follow the artist’s personal mythology, presenting her through many an­ecdotes as an accidental artist, an outsider who candidly goes to ask Vito Acconci if he doesn’t think her ‘following pieces’ resemble too closely his own. One could have hoped for a more in-depth ponde­ring of such questions on the occasion of a mid-career retrospective.